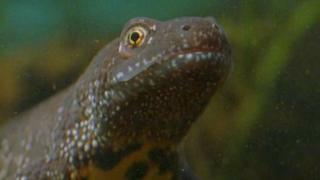 Work to build a £6.5m railway station in Ilkeston may not be completed until August 2016, after more great crested newts were found at the site. The project, due to be completed by now, was delayed in July by the protected species and later due to flood concerns. Strict monitoring rules dictate that the site needs to be free of newts for five days before work can progress. Transport Secretary Patrick McLoughlin said the delay was "frustrating". "It should have been open by now," he said. "I hope within the next 12-18 months that the station is operating." Geoff Pickford, strategic director for highways at the Labour-run Derbyshire County Council, said the newts had caused "one or two problems". "We're waiting for temperatures to rise so we can start trapping again," he said. About 171 newts have been caught, but the amphibians hibernate over the winter so the process has slowed down. Erewash's Conservative MP Jessica Lee urged the county council to get more people working at the site so progress can be made. In response, Mr Pickford said: "It isn't a question of getting more people working on it. "The whole site is fenced off, the traps are in place, it's simply a question of waiting for newts to fall into them." He added that one of the station's car parks would have to be made smaller due to flood prevention work.